As they say in the South: It’s fall, y’all. And with the changing of each season, at Trex Outdoor Furniture we like to do a little patio space refresh. Now that the heat of summer has dissipated, it’s time to spend evenings enjoying the crisp (bug-free) air! Read on for a few of our best tips for decking out your outdoor space for the cooler season. Pops of rustic oranges, garnet reds, burnished golds, velvety browns—all these hues mimic nature’s fall palette and really add impact to your outdoor space. Think large pots of bright yellow or fiery orange mums. Pumpkins, gourds, seasonal berries, and fall fruits are easy ways to incorporate natural elements rife with fall colors. If you’re creating a fall tablescape, add autumn tones into the linens and even into the menu (think cranberry spritzers and mini pumpkin pies). Don’t forget to add vibrant cushions to chairs and colorful plaid throws draped across your settee for extra color and comfort. Or for a more modern, sophisticated aesthetic, go monochrome. 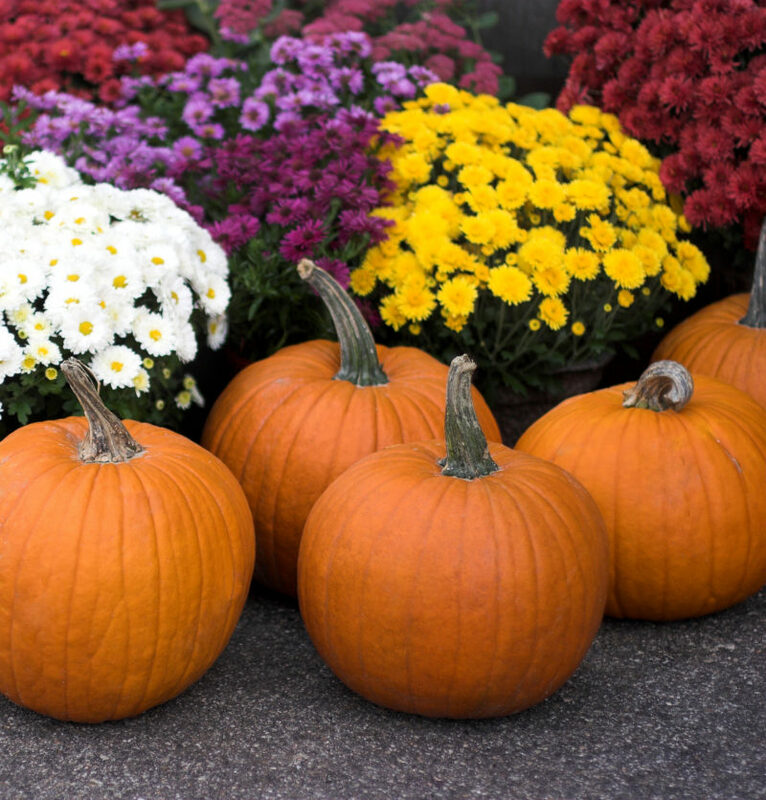 We love the look of small white pumpkins arranged on tables alongside pots of white mums almost as much as we love classic fall colors. In addition to potted mums, don’t forget to personalize your outdoor space a bit. Flank the door or stairs to your deck with luminarias or a variety of pumpkins in different shapes and sizes. Hay bales, corn stalks, and gourd galore all signify the season. That tall, galvanized metal lantern you’ve had your eye on? Or an Indian-inspired copper side table you found at a flea market? Incorporating warm pops of metallic, along with unexpected pieces adds character and a little dose of cozy eclecticism to your space. Beat the chill and stay comfortable when the mercury drops. If you’re entertaining, be sure to offer guests steaming-hot beverages. But also create smaller furniture vignettes for a cozier space; scoot those chairs closer together or pull those sofas in a bit. And in colder fall climes, consider adding outdoor space heaters, positioning your furniture close (but not too close!) to a fire pit or facing your outdoor fireplace. 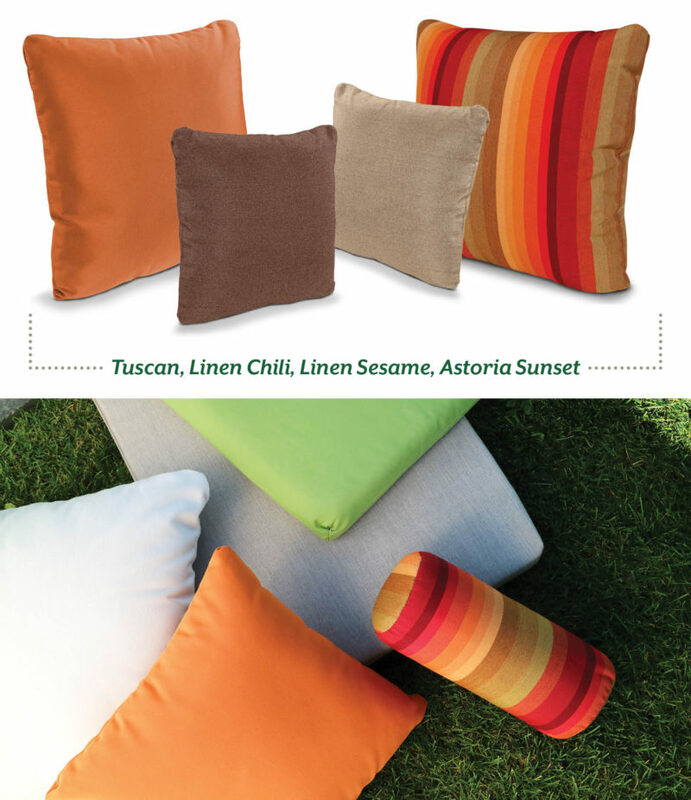 If you haven’t, change out those summer-inspired throw pillows and cushions for richly hued outdoor pillows and cushions. A settee with a black frame looks beautiful with cranberry colored cushions. Add thick cushions in jewel tones and fall-inspired colors to dining chairs, porch swings, and your chaise lounge chairs. Don’t forget to choose weatherproof fabrics like Sunbrella, which stand up against the elements. Just make sure you store them elsewhere when not in use to keep them in tip-top shape. We love Tuscan, Linen Chili, Linen Sesame, and Astoria Sunset—all Sunbrella colors that mimic fall. For additional warmth, texture, and pattern, also layer outdoor area rugs in your space. 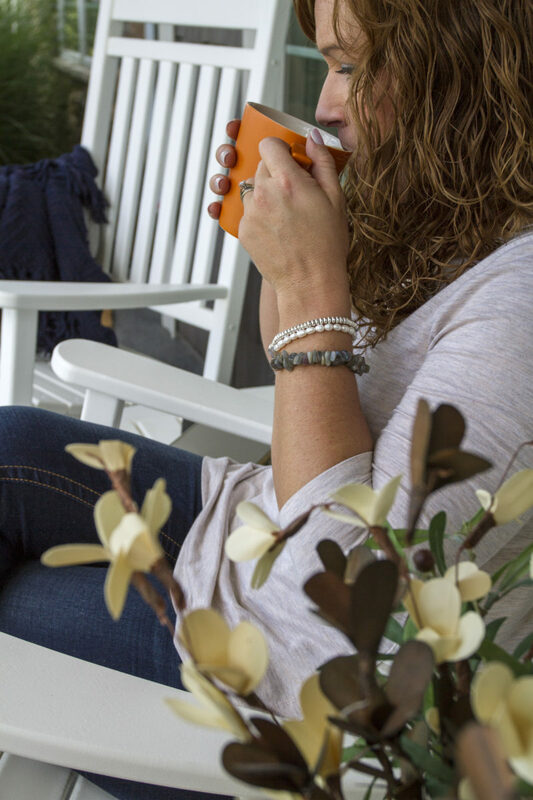 Nothing says a fall day like a classic rocking chair or a porch swing. Plop a pair of rockers to your front porch or attach a swing to the under-hang of your deck. 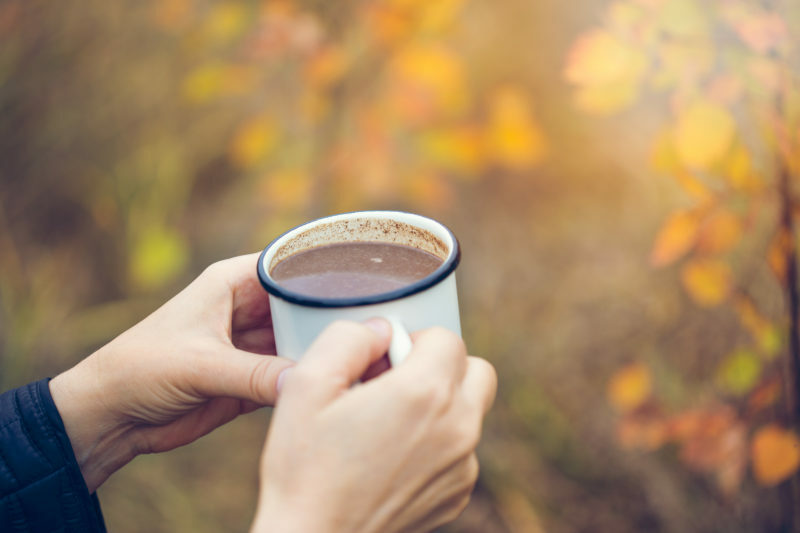 There’s no better spot to slow down and enjoy the fall leaves as they tumble to the ground on a chilly autumn day. 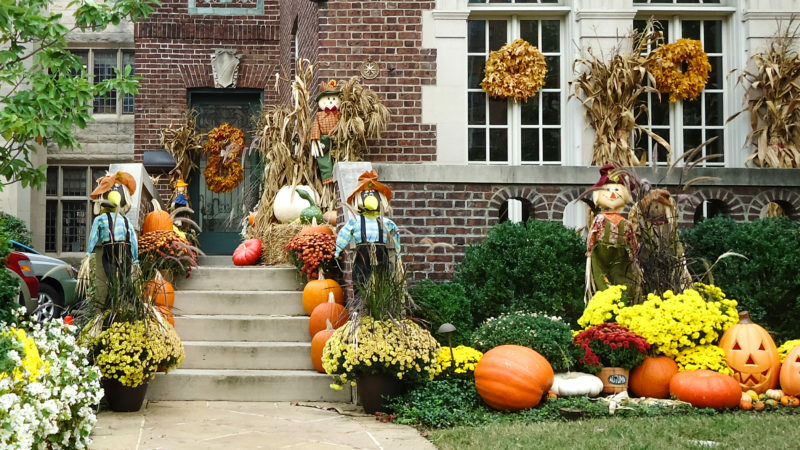 Whether you live on a sprawling estate with a large slate patio, your real estate includes a postage-stamp-size deck, or you have just a balcony and door stoop in the middle of the city, you still can decorate. 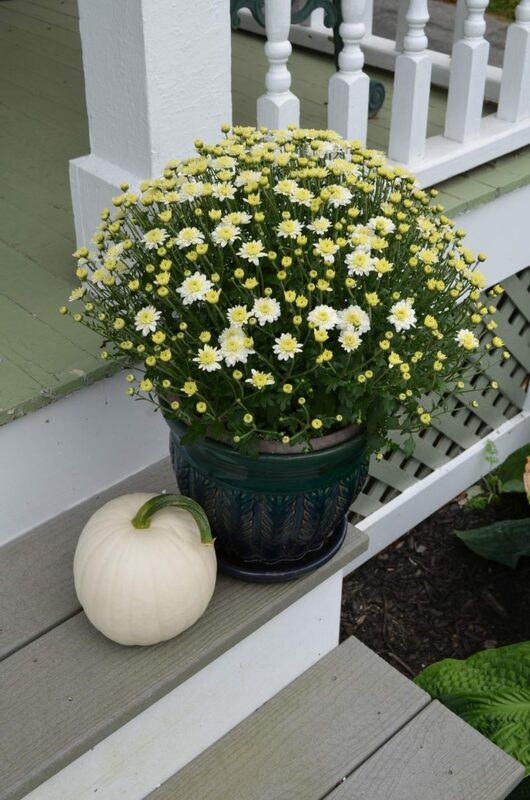 For that city dweller, a simple, welcoming pot of mums and a wreath signify fall has arrived. Even those smallest of spaces lend themselves to refreshing your outdoor space for fall. So get outside and start prepping your patio now!